As a Veteran dealing with the mental noise associated with a trauma experience, have you ever felt like "losing your mind"? I don't mean going off on someone or on some kind of rampage. I am talking about how our minds, as veterans with trauma, seems to be the biggest problem. It is constantly thinking of things we need to be afraid of and feel guilt, SHAME, or angry about. It gives us nightmares, hurts our relationships and employment opportunities, and scares our kids. It is constantly bugging us for attention. Wouldn't it be nice to be able to step out of our minds for a while and find some quiet stillness where we can relax in peace? If so then our Mind-Field Maneuvers Program is a great fit for you. Join with us to Lose Your Mind! Our Mind-Field Maneuvers Program utilizes the ancient, proven practices of Meditation, Mindfulness, and a relatively new practice called "MindLess Awareness" or "Mindlessness"and applies them specifically to dealing with trauma/Post-traumatic Stress. 20 minutes of daily Meditation combined with a MindFull and MindLess Awareness practice will decrease and eventually heal the wounds of Combat Trauma/PTSD. The program was developed by the founder of HOPE4, a Vet who needed to find a way to deal with the onslaught of compulsive thoughts and destructive emotions associated with his combat trauma experience. 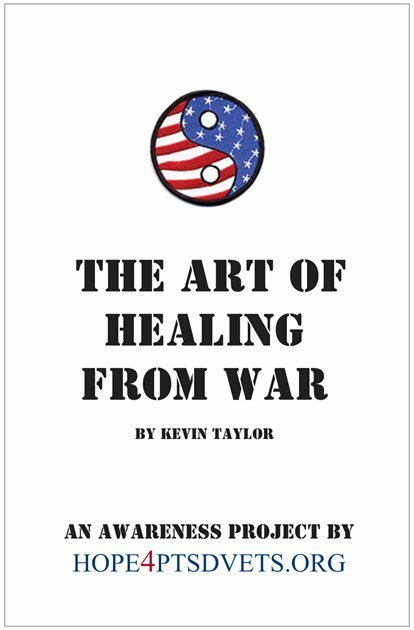 Having spent time in both prison, mental institutions, and rehabs, Kevin Taylor wanted to create a practice that could have a practical application for every Veteran wounded by trauma. A program for organizations serving homeless Veterans as well as the Criminal Justice System that could be utilized by Veteran Courts around the country. The Meditation and Mindlessness Practice this program teaches, allows the Veteran to observe his or her thoughts and emotions, creating the opportunity for the individual to choose not to participate in them therefore lowering the impact of the stress and anxiety they create. A practical path and practice utilizing Mind-Field Maneuvers to allow the Veteran suffering from Trauma/PTSD the opportunity to decrease stress, improve sleep, and no longer be subject to the onslaught of negative thoughts and emotions associated with thier trauma experience. The Veteran Courts with a viable program to assist vets that are either arrested, enter the criminal justice system, or leaving incarceration. Incarcerated PTSD Veterans with the same practical path and practice and group support so they will have a increased chance of returning to society and being productive and happy. The purpose of meditation is not to create a system of beliefs, but rather to give guidance on how to see clearly into the nature of the mind. In this way one gains first-hand understanding of the way things are, without reliance on opinions or theories - a direct experience, which has its own vitality. It also gives rise to the sense of deep calm that comes from knowing something for oneself beyond any doubt. The term Recon Meditation refers to practices for the mind that develop calm through sustained awareness and insight through reflection. A fundamental technique for sustaining attention is focusing awareness on the body; traditionally, this is practiced while sitting or walking. This guide begins with some advice on this technique. Reflection occurs quite naturally afterwards, when one is 'comfortable' within the context of the meditation exercise. There will be a sense of ease and interest, and one begins to look around and become acquainted with the mind that is meditating. This 'looking around' is called reconniassance, a personal awareness that can only be suggested by any technique. What is Mindless Awareness or Mindlessness? Mindless Awareness is simply the practice of stepping outside thought and into awareness. As a veteran with Post Traumatic Stress my mind constantly felt full. Full of all kinds of thoughts, which distract me from being present in the moment, and create a plethora of emotions but mainly fear about the future and anger about the past. The idea that I could step out of that bombardment of mental noise and find a place of quiet and stillness within my own mind (mindlessness) sounded too good to be true, until I experienced it myself. The truth is that we have all experienced pain on some level. Whether it is physical, emotional, or both we all know pain. If you are looking on this site the chances are that you have suffered from a significant amount of pain and wish to recover from it and stop creating more. For me it was not just all the pain I had experienced, it was all the suffering I was creating for others as well. Separation begins when we see ourselves as detached from our surroundings, a separate entity. We create an identity for this entity and begin to protect and cling to it. The Buddhas' second noble truth has been translated to say that suffering is caused by attachment, discontentment and expectation. To be attached to some thing it must be separate from I. It becomes something I either want or don't want, like or dislike, fear or crave. This process creates ego, emotional pain history, and expectation; which in turn, creates suffering. To eliminate suffering is not to eliminate pain. We will always experience pain but suffering from that pain is a choice. Suffering can be overcome through human activity, simply by removing the cause. We can end suffering by awakening to consciousness and practicing the ability to observe mind and emotions. Once we can observe thought and the emotions associated with them we have a choice on whether or not to be a willing participant in them. By practicing mindfulness, abiding in the moment, and cultivating compassion, suffering diminishes. The eight aspects of these precepts are not to be understood as a sequence of single steps, instead they are highly interdependent principles that have to be seen in relationship with each other. It is the intention of this project to encourage the development of these areas through the practice of Meditation and Awareness. Mind-Field Maneuvers does not claim the label of any religious tradition and embraces all ideals which encourage consciousness, mindfulness, tolerance, and compassion. Be Present: This is the center and essence of all the tactics. True reality only exists in the present moment. The moment a thought occurs to us it is already in the past, filtered through our experience and perceptions. We engage in all of the following tactics with the intention of being fully present in each moment. For each moment we are fully present we are victorious over trauma. Practice Mindfulness: Mindfulness practice is simply being present in the moment and in that moment being mindful about your thoughts and emotions. Meditation allows us to awake to our true nature and the present moment while Mindfulness is the practice of this wakefulness in our daily activities. Experience Truth: When I use Truth here (Capital "T") I do not mean something that we can demonstrate to be true like a mathematical equation. The kind of Truth I am referring to is of a spiritual or consciousness nature. Truth such as this, like reality, can only be experienced. The minute we try to describe it we dilute its meaning. It has been filtered through our own experiences and perceptions and is no longer reality or truth. We can use language, metaphors, allegories to point to truth, but never can we explain or define it. Truth must be experienced. Through being present, meditation, and practicing mindfulness we give ourselves the best opportunity to experience Truth. Contemplate Impermanence: When we contemplate impermanence we are not only talking about things like the price of gas. We are talking about thought and emotion as well. Everything that we can touch, taste, smell, hear, feel or think is impermanent and in a constant state of change. Heraclitus is the famous guy who told us 2500 years ago that the only constant is change. He also said, "You never step into the same river twice." Contemplating impermanence allows us to understand that attachment to or expectation of anything only leads to suffering. When we accept that everything is constantly changing we begin to find peace. Observe Intention: Observing Intention is also a result of our meditation and mindfulness practice. When we begin to see that we are not our thoughts and emotions we can begin to honestly ask ourselves what our intentions are in any given moment for any action. Knowing and understanding our intentions leads to less ego based emotions, thoughts, and actions. In my work with the homeless veteran, through being mindful of my intentions, I have observed that there are two things at work within me. My true nature finds peace in connecting with and helping other veterans. Then there is my ego which wonders how it will benefit from helping others. The ego wants to be praised and noticed for helping which, obviously, is selfish by nature. I treat my ego as I do my own adolescent children; with patience and compassionate while also holding them accountable because it is my responsibility. And remember, does have a role and our intention is not to eliminate ego but to be mindful of its presence and influence. "Two people have been living in you all your life. One is the ego, garrulous, demanding, hysterical, calculating; the other is the hidden spiritual being, whose still voice of wisdom you have only rarely heard or attended to - you have uncovered in yourself your own wise guide." Cultivate Compassion: When I speak of compassion here I am not just referring to being compassionate to others but most importantly being compassionate to both our ego self and our trauma experience and any shame or guilt associated with it. Compassion grows when we experience our universal connectedness to all things. It is NOT empathy for that is still based in feeling separate from each other. Compassion comes from connectedness. As our Meditation and Mindlessness practice matures compassion for others will grow naturally. It does, however, take awareness to cultivate compassion for ourselves. When we make mistakes and we always will, smile like you would if your child spilled their drink all over the tile floor, and say, "That's cool, we can clean it up together." Embody Gratefulness: Dictionary.com defines gratefulness as warmly or deeply appreciative of kindness or benefits received; thankful. Gratitude comes pretty easily with compassion, mindlessness, and meditation. It is a key ingredient in happiness along with contentment. Contentment also naturally occurs with being present in the moment. To embody gratefulness one must not only be present but observe the beauty of that moment. For those of you, like me, who have lost comrades either over there or over here, I know this is a difficult one. It will grow slowly when you cultivate that compassion for yourself. Encourage Consciousness: This is important to the combat trauma veterans who are still deeply suffering from their invisible wounds. The most important thing to remember about Encouraging Consciousness is to listen and to do so being very aware of the ego and its intentions. We must understand where someone is coming from, the experiences and beliefs that have brought them to this point in their lives. We simply encourage someone to awaken to the connectedness of everything through our practice. We are NOT preachers or evangelist. Our practice and the healing and wellness we find from it will create curiosity and invite questions. We greet these questions with more questions because consciousness must be experienced through those questions and not answers. What is the true reality? Can you trust your mind to recognize or interpret reality outside of your own perception and beliefs about it? Are you your mind, thoughts and emotions? If you are not your mind, thoughts and emotions, can you observe them? If you can observe your mind, thoughts and emotions, can you choose whether or not to participate in them? If you can observe your mind, thoughts and emotions, then what is doing the observing? If you are not your mind, thoughts and emotions then who are you? Are you the labels your mind, thoughts and emotions have interpreted as your identity? If you are none of those labels then again, who are you?